With over 600 commercial corridors and 300 vibrant neighborhoods, New York City is a city of neighborhoods, each offering their own unique small town feel. You can go to Washington Heights in Manhattan to enjoy Dominican dining and culture; visit Calle de Colombia, more commonly known as 82nd Street in Jackson Heights, Queens; or soak in the rugged shoreline feeling of Van Brunt Street and Pier 41 in Red Hook, Brooklyn. With unique character, comes unique challenges, and the New York City Department of Small Business Services (SBS) is responsible for strengthening New York City's commercial corridors by supporting small businesses and entrepreneurs, as well as neighborhood leaders in all five boroughs. We do this primarily through our network of 67 Business Improvement Districts, and our NYC Business Solutions Centers. But we can't do it alone, and public/private partners like Citi are invaluable in helping us achieve our goals. With contributions from Citi Community Development and other private funders, we recently announced a Small Business Assistance Grant program that offers up to $5,000 to small businesses impacted by Superstorm Sandy. These grants will give small businesses a badly needed lift -by replacing a fallen awning, repairing a freezer, or buying a new mixer-- to help them get back on their feet. My earliest good fortune was to have been raised by parents who instilled in me the importance of family, community and the simple pleasure of having "sand in my shoes" - a sentiment treasured by all those who live in the Rockaway communities. Every year my parents, my brother and I spent our summers on the white sandy beaches of the Rockaways, a narrow sand bar of an island between the bay and the ocean within eyesight of Manhattan. For generations we had joined its residents to enjoy all the peninsula had to offer and my husband and I continued to pass these traditions and love for the Rockaways on to our children. From the Parks Department concessions on the board walk to the Public Libraries in Far Rockaway and Rockaway Park, shopping in Bell Harbor to dining at the restaurants in Breezy Point; the Rockaways were not just a summer oasis but a significant member of our family. Unfortunately, that beloved community was ravaged by Hurricane Sandy. The powerful flood water surge washed away, damaged and destroyed residential and business properties and with it--in so many cases, including my own--some of our most precious memories. I realized while sifting through the damage of our home and checking in on family and friends who had been affected that the storm had severely impacted the future of the community's residents, small business owners and aspiring entrepreneurs. I had to put aside my overwhelming sadness, utilize the resources at my disposal and act quickly to help rebuild. I work for an organization that recognizes the importance of communities, their residents and the small businesses that are the foundation of thriving neighborhoods. Encouraged by senior management and in partnership with my colleagues in Community Development, we developed a targeted plan focused on recovery for the homeowner. Three days after the storm hit, Citi's immediate response - a $1 million dollar donation in emergency funds to the Red Cross to aid in their relief efforts, was quickly followed by an additional $500,000 to support five community based organizations that could execute on the ground and deliver immediate recovery assistance to in the hardest hit areas across New York City, Long Island and New Jersey. While my family will not directly benefit from Citi's critical response, many in the communities impacted--especially homeowners and small businesses--have been. This past week, I took a short walk with my two young daughters from our house to a 100-year-old industrial building in the heart of our Mission District neighborhood in San Francisco. We went to see the massive kilns being prepared to fire the first San Francisco-made tile in more than 50 years at Heath Ceramics. For me, as Executive Director of SFMade, -- founded at the height of the Recession in 2010 with a mission to support and build San Francisco's urban manufacturing sector -- seeing this project come to fruition is a reflection of our community's collective work to grow our local manufacturing base. From helping Heath locate the vacant former commercial laundry building that would become their home, to navigating planning and permitting, to assisting with the hiring of new employees, SFMade has collaborated with Heath and a wide array of private- and public-sector stakeholders -- including the active support of our own Mayor Ed Lee - to realize what is now a model for other local manufacturers and other neighborhoods. 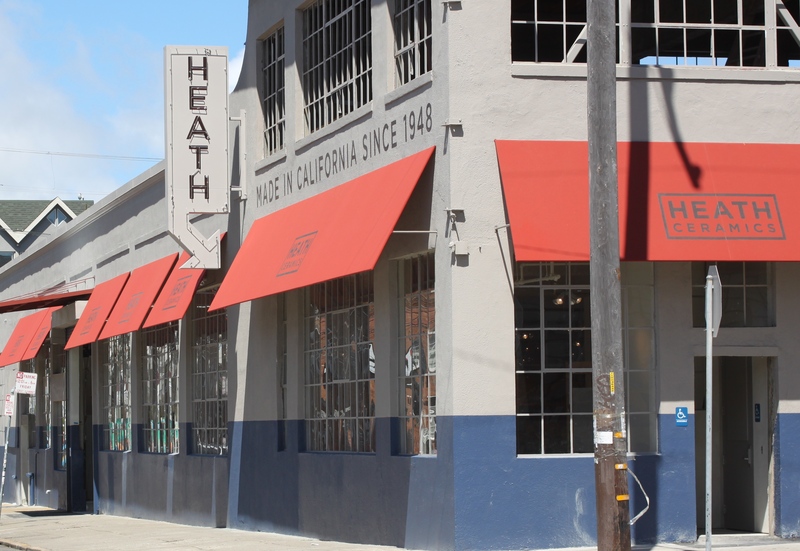 And for Heath Ceramics, their decision to build a factory in San Francisco (the original factory in Sausalito is still operating) represents a homecoming of their own: Heath was actually founded by Edith Heath on Clay Street in San Francisco. Today is National EITC Awareness Day in the U.S., and in a guest post on the New America Foundation's blog The Ladder, Bob Annibale, Citi's Global Director of Community Development, focuses on ways to provide the tools and knowledge necessary for working families to achieve economic stability. From Access to Assets: The Vital Role of EITC VITA sites details on how Citi is working with nonprofit organizations across the country to increase awareness of tax credits like the Earned Income Tax Credit (EITC) through Volunteer Income Tax Assistance (VITA) sites, and connecting people with comprehensive support to build financial assets. On Saturday January 19, I was proud to join Mayor Edwin M. Lee of San Francisco and Bob Annibale of Citi Community Development in Washington, D.C. as they accepted the 2013 Excellence Award for Public-Private Partnerships from the Mayors' Business Council of the US Conference of Mayors. The award honors the unique public-private partnership between the City and County of San Francisco, Citi Community Development and Citibank for San Francisco's Kindergarten to College program. What is Kindergarten to College (K2C)? The City and County of San Francisco's Kindergarten to College (K2C) initiative is the nation's first universal college savings account program. Launched in 2010, K2C is designed to embed a savings culture among San Francisco's children as a driver to expanding college access and increasing college completion rates by automatically opening a savings account for every child entering the City's public schools in kindergarten. Public-private partnership is at the center of the program, supporting the identity, operation and success of K2C. Reflecting on 2012 and the past few years, many of us feel that the world is vastly changed. Suddenly, it seems, we live in a world where debate on our national budget can put us on a fiscal cliff, hurricanes can cripple mighty New York City, and employed Americans are homeless. Most of us may be unaware of this last change: that poverty afflicts even those who work hard. It contradicts a dearly held belief about what it means to be American. To advance understanding of this phenomenon, the United Way of Greater Dallas presented The Community Financial Stability Summit on December 5. The Citi Foundation sponsored the event in collaboration with the Communities Foundation of Texas, and there, Pulitzer Prize winning author David K. Shipler presented selections from his book, The Working Poor: Invisible in America. The audience heard stories of the bank teller with two dollars in her checking account, the gas station attendant who doesn't own a car, and the woman who can't work full time because she rides the bus for three hours to and from her job each day. Typically, the individuals in Shipler's book also lack insurance and have subprime credit scores. In celebration of Citigroup's 200th Anniversary, we are sharing stories from our rich history here on this blog. The 37th installment below covers how the bank supported American communities through job creation, small-business finance, and affordable housing initiatives. Read the 36th installment which explains how Citi and the Citi Foundation promoted financial inclusion worldwide, here. There are more than five million Americans who have been actively seeking a job for six months or longer. The so-called long-term unemployed represent 40% of all unemployed workers, and face the additional challenges of job-search fatigue and a lengthy period during which they lack previous levels of regular income, or none at all. Citi Community Development is now working with The WorkPlace on the national expansion of the highly successful Platform to Employment (P2E) program, which creates a pathway to employment for the long-term unemployed. P2E, which began in southwestern Connecticut, will be expanded to address the specific needs of unemployed workers over 50 and military veterans, thanks to additional support from AARP Foundation and the Walmart Foundation. Starting in January, P2E will launch replication sites in 10 U.S. cities, beginning with Chicago, Cincinnati, Dallas and San Diego.